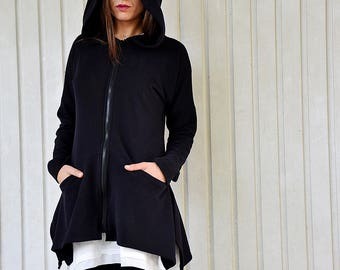 Extravagant black jacket with zip, big collar and hoodie. If you prefer different length of the jacket or sleeves please inform me. I can make the jacket according to your size. Enjoy this jacket and always be in a good mood! I really do love this coat it's extremely comfortable and just enough for a chilly evening. The shipping and delivery were well within what I expected.